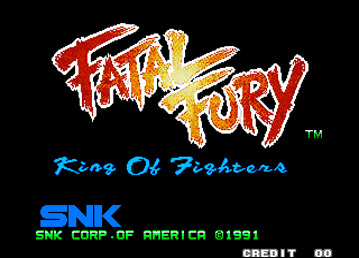 First fighting game on the Neo Geo, Fatal Fury is SNK's answer to Street Fighter II. 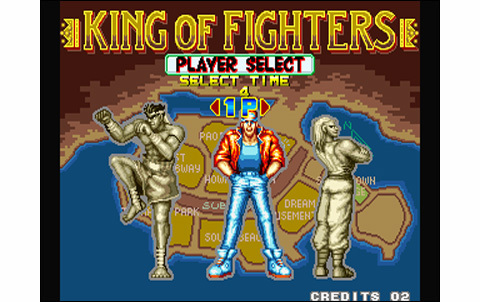 Terry, Andy and Joe are back to Southtown to enter the King of Fighters tournament. 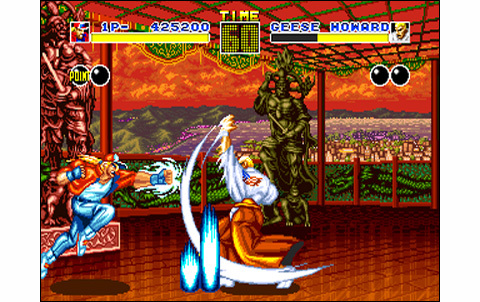 The three warriors have secretly came to avenge Jeff Bogard's death, who was murdered years earlier by the tournament's promoter: Geese Howard. 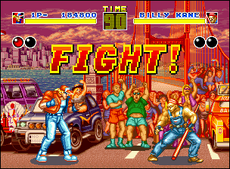 The Bogard brothers and their friend Joe will have to face eight opponents tougher than each other. 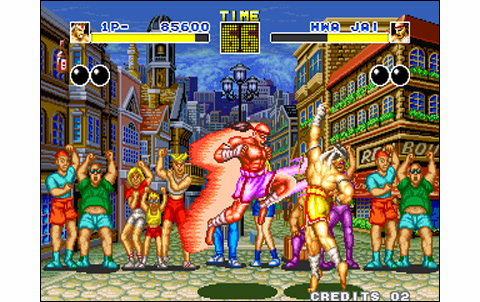 Not really copying Capcom's hit, SNK gave his Fatal Fury some real personality and a slightly different battle system: the heroes are fighting on two planes, providing a sort of '3d' to the fights. After pressing the start button, you have to select one of our three buddies. It's of course possible to fight against each other, but also two against the computer! 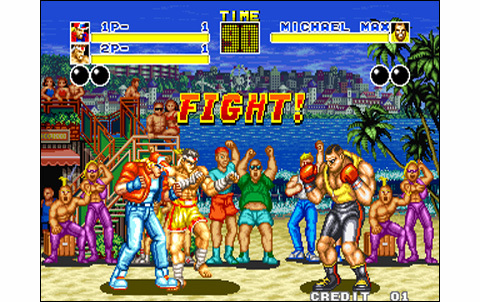 This is a very fun and almost unique feature in a VS fighting game, but it's limited: in case of victory, players will have to fight each other in order to decide who's going to continue the tournament. 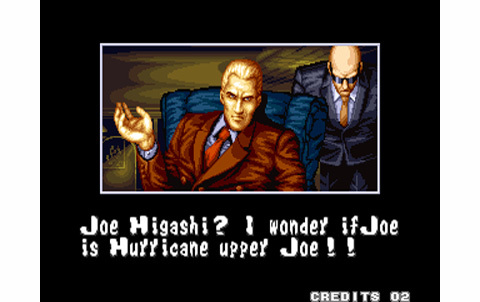 The realization is successful for a 1991 game. 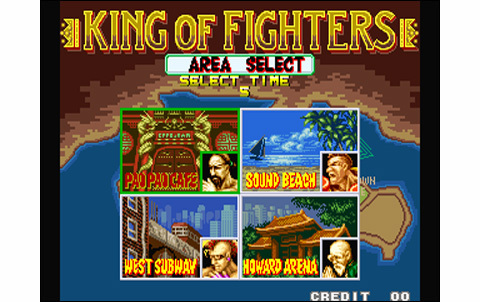 The graphics of Southtown are beautiful, with the weather changing throughout the rounds - detail that will often be re-used in later SNK games - and places where the battles take place are varied: we go from the Dream Amusement Park and its ferris wheel to Tung Fu Rue's splendid oriental house, passing by the delightful Pao Pao Café and the paradisiacal Sound Beach. 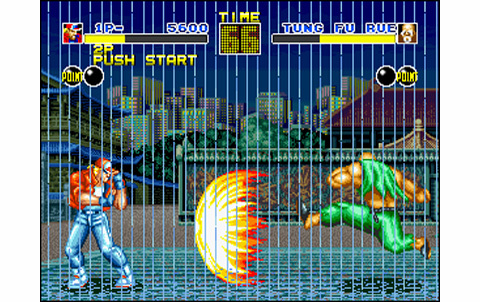 The opponents are original and have personality: we feel like fighting in Jean-Claude Van Damme's Lionheart, that's fun! 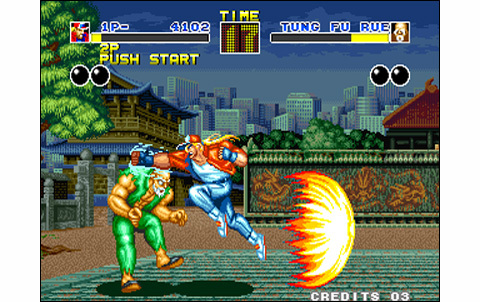 Gramps Tung transforms in a monstruous warrior after a few blows, Wha Jai drinks a potion that makes him super fast during the fight, Raiden is a huge wrestler ... This is all new and a pleasure to discover for the first time! The animation, on the other hand, although being decently made, is a bit steep and could have been more fluid. 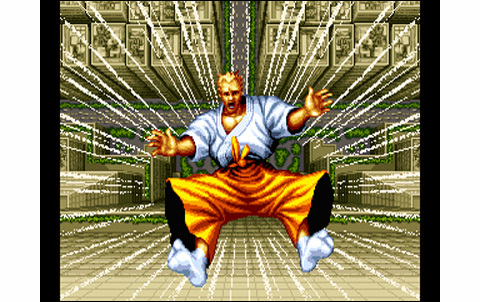 The decomposition of the moves shows a very good level even for the time... without making a shadow on Street Fighter II, let's be clear! The musics are simple, but most of them are pretty catchy and dynamic. Among the most memorable themes, one will remember the Brazilians (or Arabs, we do not know too much?) 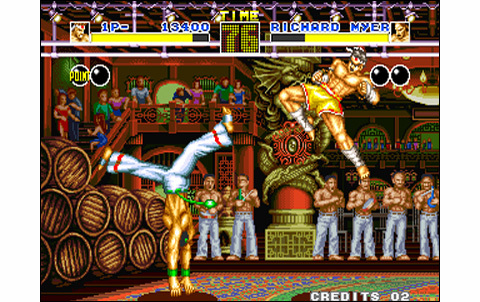 chorus at Richard Myer's Pao Pao café, the "zen-pop" melody of Tung Fu Rue's stage, or of course the violent guitar riffs accompanying the final fight on Howard's Building rooftop. And let's not forget the great hard-rock theme in Dream Amusement Park, of course! 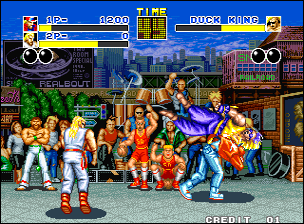 To complete this, the game features great impact sounds, providing a powerful feeling during the fights. 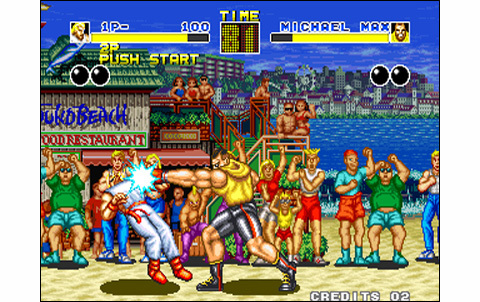 Punches, kicks, throws, specials: each move depending on its strenght produces a different one. An overall realization quite neat, that's true... but far from perfect yet. 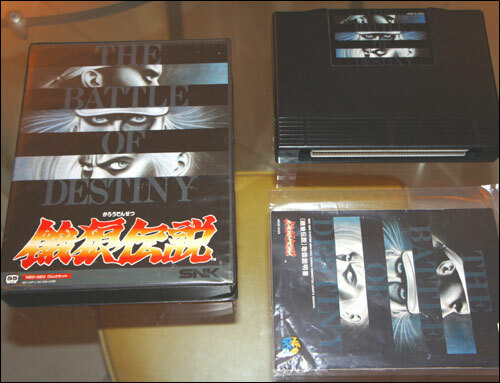 The gameplay is still in its infancy, unfortunately. The two planes cannot be used yet, there is no way to travel voluntarily on each one. The special moves are hard to execute, because the geometry set is not very flexible. In addition, it removes way too much life! Three Power Waves, and you're done... Ouch! 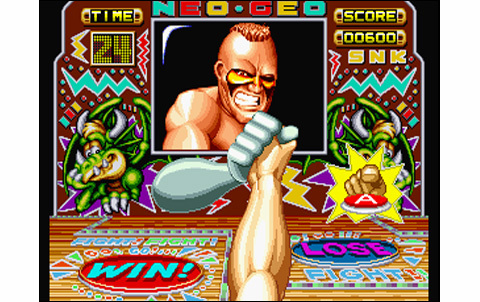 The range of basic moves is not huge, with a configuration of three buttons assigned to a quite simple use: A is for punches, B for the kicks, and C performs a throw when you're close enough (which is not too ergonomic nor intuitive). 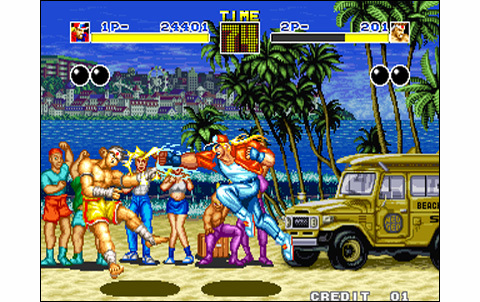 By cons, the special moves are many (four for each character, which is above average back in 91) but besides that, the basic attacks are too few to offer a real technical depth. 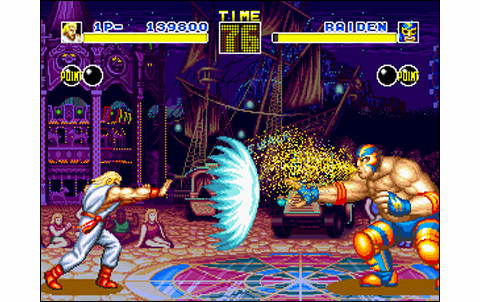 Fatal Fury is at this level a bit limited still... and moreover, it also lacks a little smoothness in its moves. Finally, the replay value of Fatal Fury is average: only three selectable characters and eight opponents to beat. It's fairly light compared to Capcom's competitor... 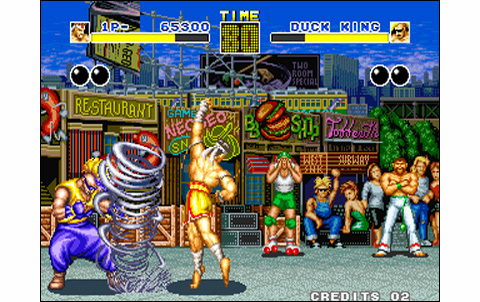 The presence of fun bonus stages (arm wrestling) and of course the scenario's atmosphere provide a little more depth and interest to the game. 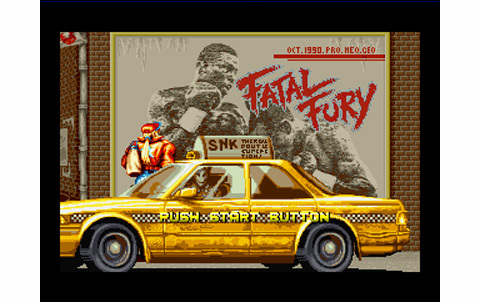 Apart from a warm ambiance and a real personality, Fatal Fury does not measure up to the great Street Fighter II... for the moment! Finely drawn and full of charm, stages and characters of Fatal Fury are looking good. Quite fast for a 91' game, while far from being a benchmark in terms of decomposition. Numerous vocals and good effects, while the various themes are excellent and stick to the action. 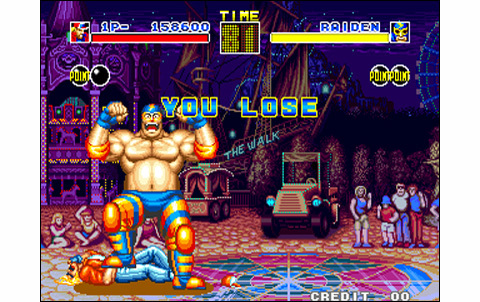 Three characters only, eight stages that can be cleared quickly with a little training... That's a limited replay value. Good ideas are present, but the controls are far from perfect (specials hard to perform) while it's still acceptable and fun. A nice try from SNK, but not totally convincing . 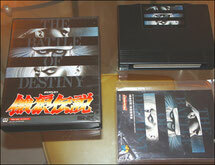 A beautiful japanese box for the AES, costing about 45 euros and looking great in a collection. 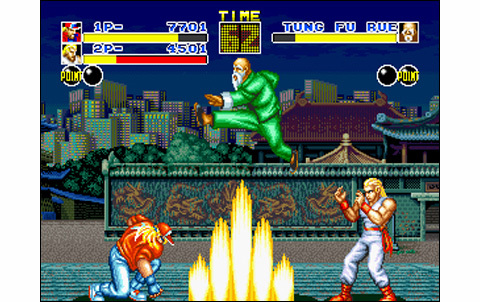 If you just wish to discover the saga, the game is cool and old-school, but if you wish to spend hours playing versus, prefer Fatal Fury Special, better and cheaper!